I intuit that this timeless experience continues to nurture your relationship with Life and one another. Most couples/dyads have not shared such a transcendent unification and regard physical death as separation. What significance does physical death hold for you as a couple/dyad? 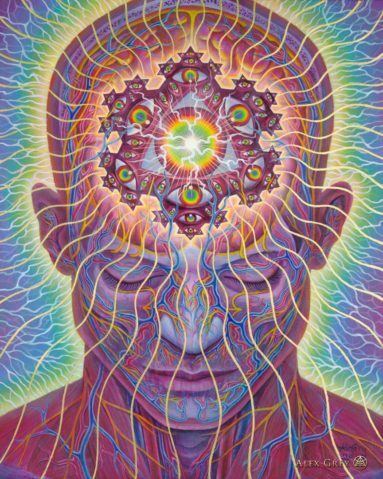 Alex Grey : When death comes it comes and I will probably be surprised. I don’t look forward to death because we have so much work to do together in this dimension. We will take what God wants to give. I am grateful to have had the perspective of the Universal Mind Lattice to guide us. At my best, I am in the light of that experience. As dark as I get now, it would be way darker if I were the one left on earth. Separated by death, I’d be lonely without my beloved and would try to communicate beyond the grave. We’ve had discussions on the matter and would do MDMA to connect with each other from across the dimensions. John: Alex, your occupation as a young medical school mortuary preparator and embalmer and your art relating with human cadavers, foetal monsters and dead dogs pushed your identification with embodiment to inhuman extremes. How significant was this "road of excess" in Allyson's and your awakening to a world beyond opposites, where "the visible and invisible universe became our family”? Alex : Through the medical school friends and library, I learned of the Visuddhimuga, the Buddhist "Path of Purification,” which describes forty meditation objects. Ten are meditations on the dead, going to charnal grounds, contemplating skeletons and rotting corpses of various kinds. This was to loosen the meditator’s fixation on the perishing flesh and dedicate oneself to spiritual development. I read the Tibetan Book of the Dead and then added a little ritual of suggesting to the new arrivals at the morgue that they realize that they are now dead and should aim their consciousness at the brightest light that dawns for them. I sought out an in depth and lifelong fascination and study of Tibetan Buddhism, influenced by the exquisite depictions of the Psychedelic Mind through the tanka paintings. We realized that every work of art has an ethical side to it, reflecting the artists’s values and character. The aesthetic choice becomes a moral choice. Any transgressive energy ultimately lead us to the Sacred Mirrors as a way of divinizing the body, mind & spirit, the fleshly experience of incarnation. Being willing to work with the dead became an opening to Divine possibility, not only reflected in the beautiful masterwork of biology, but through the gift of human consciousness we could imagine our continuity beyond the body. John: Your Meditation on Mortality ritualized 1976's awakening. Your performance affirmed your recognition of your shared life as a transformative path. You are conscious co-creators of art and experience. Have you envisioned how you will shed your bodies? Allyson: Our awakening happened when we first independently saw God. Recognition of having Found the One happened when we shared our experiences of God contact. Our Universal Mind Lattice experience affirmed our ability to be in the same mind space in an alternate reality. Meditations on Mortality ritualized our becoming Grey. It was our performance wedding. I hope I shed my body peacefully. Our parents and grandparents all died lying in comfortable clean beds. How fortunate. 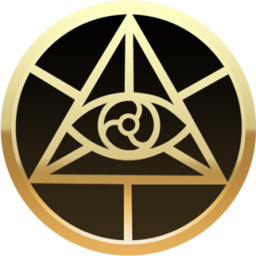 Alex: Meditation on Mortality symbolized our ability to connect outside of the circle of duality. Grey brought us together in a Polar Unity ritual. 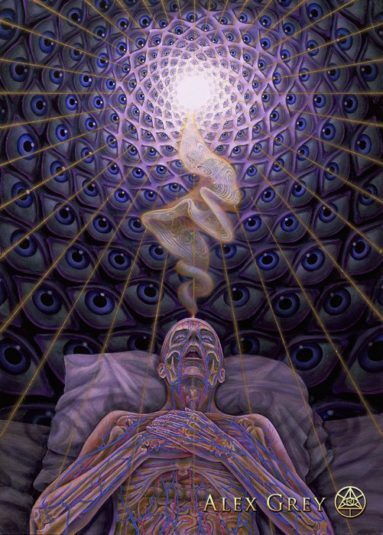 We have envisioned being plastinated, both in a meditating posture eye gazing at each other. Our friend Martine Rothblatt suggests making a robotic doppelgänger to outlive us but carry our memories and observations to another generation. One could at least create a 3d animated self that could be skyped by loved ones or associates. I’m not sure how useful it would be but it would be a cool work of art. It would be a way to maintain a virtual presence, which for many is the only way they will meet. John: Do you anticipate that physical death will significantly change your relationship? Alex: Of course physical death would significantly alter our “state of matter and mind.” And I have had experiences of us being together in other lifetimes. With our parents dead, we feel both farther away from them, and closer than ever. This may be a facsimile archetype we are inventing in our minds, but it may have some resonance with the departed soul. We’ve had friends contact us from the other side and take elaborate steps to get our attention and communicate. Some contact with souls that are so close to our hearts would seem both part of the grieving and integration process, on both sides. The Tibetan Buddhists recommend reading the Book of the Dead to guide the dead person to the highest possible incarnation, and to face all arising as a teaching. In this Bardo scenario you have 49 days to recycle into another dimension, the dead leave the living, to allow their living to go on unhaunted. Then there is always re-incarnation, the Tulkus of Tibet claim a thread of continuity between lifetimes. In Western religions they edited out the model of reincarnation. If St Peter is welcoming you into the gates of heaven, you don’t really come out once you’ve gone in. So there is this sense of asking if it would be o.k. to wait just outside the door. I think there is a holding zone, classically where spooks are imagined, Think, the landscape in Beetlejuice. Swedenborg believed there was an afterlife very much like our own where spirits lived in cities and you could visit those cities if you were sensitive to the alternate reality of the world of spirits, where communication is difficult but not impossible or unknown. Receptive and creative people commune with spirits of various kinds. Allyson: My father’s death followed my mother’s death by two weeks. I hope he found her. I have experienced a past life in which Alex was not a part. I died of starvation as a poor small child. In this life, I was given the chance of a life in joy and abundance. A young couple asked Buddha, “We are so sad when we think that someday one of us will die and leave the other.” Buddha told them that if they lived their lives togethr following the same path, there was a chance they’d be reborn as one person." One person embodying two devoted lovers would be both humble, self-reflective and filled with love and compassion, reborn a Buddha. John: Is your relationship grounded in the deathless? Alex: The Universal Mind Lattice is our shared experience of the ground of ultimate love. We were each an individual node in a vast love network with access to multiple lifetimes, able to savor each one like works of art, a thread through the beads of lifetimes. Love is deathless, a continuous interplay of journeys. Do we live by this truth every moment? No. We collect experiences and hopefully not too much bad karma. Allyson: Our relationship is fated in this lifetime. How fortunate we have been. Holding on is ultimately suffering. Eternal is our love. God knows what’ comes next. Death is clearly the precipice over which we cannot see, until we do. You have stated that one can alchemically cheat death through transforming life into Art. Your dyadic existence has evolved into being One Artist — or an Artist of One — while enhancing your individuality. 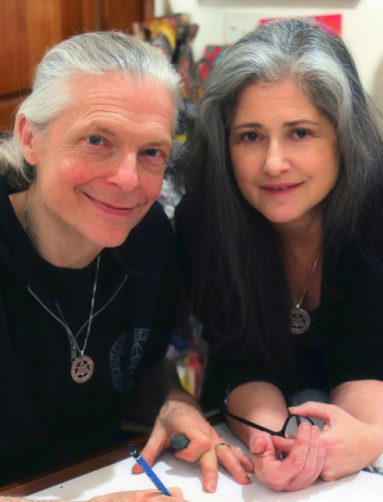 Have you met couples, dyads, lovers who have alchemically cheated death through making their life an art? First of all, we are two artists collaborating in love. Our collaboration is the Third Force, a creative angel that manifests something greater than either of us could accomplish on our own. You can’t think of Laurel without Hardy, Gilbert without Sullivan. William Blake’s wife, Catherine, was very beloved and somewhat known by Blake scholars. She was a student of Blake. They were twin flames. The monumental sculptor, Christo, collaborated throughout his career with his wife, Jean-Claude who said, “I don’t draw. We work together on every thing else.” Memorable collaborations are actually rare, more will come as gender balance consciousness expands and cooperation is valued over competition. All artists that are most remembered, Michaelangelo, DiVinci, Van Gogh — leave traces behind that are so beloved as to keep their souls alive in us. John : What opportunities do non-visionary couples have to access unitive states to discover their ground of being beyond humancentricity? Alex: The imagination is the bridge that unites you with transcendental Divinity, a connection with the beloved beyond the body. To have a beloved you have to imagine the beloved. You become enchanted by your imagining of this person. You don’t have to be Visionary to hold the power of love sacred, but, to have love you have to have imagination. Anyone can meditate and imagine a transcendental ground of being as emptiness, a vast expanse of voidness, wisdom, and infinite compassion. Lovers can access their oneness through their connection with this higher dimension. A student attained instant enlightenment when he witnessed Buddha lift a flower. 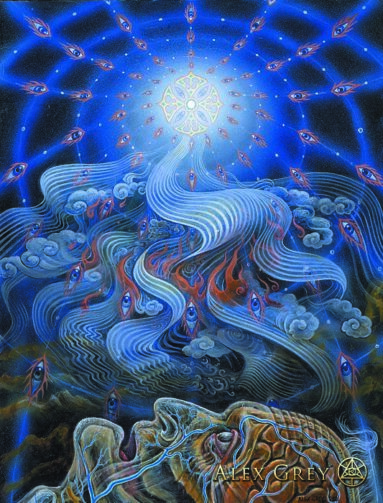 The transcendental realm beyond form is a mystical insight throughout world religions. John: You as a couple are Consciousness. Your art originates beyond polarity, from the Universal Mind Lattice, from Consciousness itself. Your art always inspires self-awareness beyond limiting identity. Death is release from outgrown perspectives. Has your multi-faceted co-creating instilled a calm assurance that you will effortlessly continue to co-create, co-evolve, throughout all transformations of consciousness? Allyson: Death is the end of your job on this plane of existence, a journey to next plane of existence. When and what will happen next is God’s secret. Alex: I wish we could continue our journey together in a constant braid of souls, particularly with our one daughter and many of the people closest to us and around us. To make definitive post-death claims is to sound like you’re full of malarky. Socrates questioned the nature of death because he was curious. He kept an open mind and was ready to check it out. 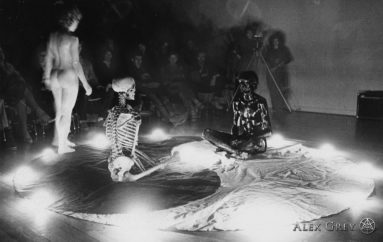 Alex: In 1976, Allyson and I had an experience which changed our lives and our art. We sacramentally ingested a large dose of LSD and lay in bed. Eventually, a heightened state of consciousness emerged where I was no longer aware of physical reality or my body in any conventional sense. I felt and saw my interconnectedness with all beings and things in a vast and brilliant Universal Mind Lattice. 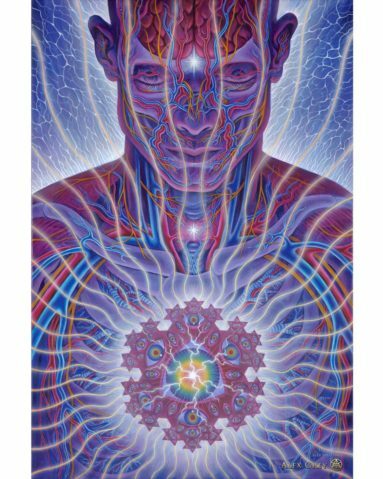 Every being and thing in the universe was a toroidal fountain and drain of self-illuminating love energy, a cellular node or jewel in a network which linked omnidirectionally without end. All duality of self and other was overcome in this infinite dimension of spiritual light. I felt I had been there before, or perhaps in some way was always there. This was the state beyond birth and death, beyond time, our true nature which seemed more real than any physical surrounding and more real even than my physical body. The clear light matrix arose out of a field of pure emptiness. As utterly convincing as it was, when the light receded, I opened my eyes to behold Allyson and our bedroom once again. I was somewhat shocked to learn that she had experienced the exact same transpersonal dimension at the same time, which we determined by our descriptive drawings and discussion of the awesome beauty of the state. This experience of the infinite net of spirit transformed our lives and gave us a subject which became the focus of our art and our mission. However we transcend and transform ourselves, let us be encouraged not to lose hope; the ground of infinite compassion and illuminating vision is everyone’s rebirthright. Art can illumine the shadows and pains of ego’s death, and art can midwife the soul’s brilliant rebirth.